Also of critical interest to this new edition is Luke Davies’ Foreward and Stephen Kelen’s Afterword. Both are of critical importance to anyone wanting to gain a better understanding of the Sydney poetry scene of the early 1980’s and highlight the critical role played by small presses during the period. 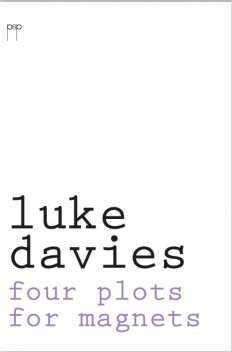 Grant Caldwell launches Four Plots for Magnets by Luke Davies. Pitt Street Poetry 2013 (original edition Glandular Press 1982) Wheeler Centre, Melbourne, May 15, 2013. Some fiends recently told me about a book launch they attended where the launcher spent most of the half hour launch speech talking about themselves. I hope I can avoid this but I need to warn you that I will need to talk about myself in relation to Luke and the original issue of this book because in this seminal period of 1981-2 for both of us our lives were closely connected in numerous ways. I will talk about the book and the poems but first I will need to establish some background in our collective histories, as I remember it. I might add that Luke has asked me to do this, for the same above stated reasons. In 1981 I had been living in an apartment in the run down but amazing sandstone constructed original Darlinghurst Jail warders residence for about two years when two young poets moved into the apartment below me. The building was nine narrow addresses with three floors, and I had the top or third floor and Luke and Steve Kelen moved into the second. The fact that we were poets was entirely coincidental. I was 34 years old and they were about 19, so I must have seemed like an old man to them, but we quickly established friendship and conversation over the social lubricant of the day: the bong (sometimes the joint), oh, and poetry. I saw Steve as an exuberant, somewhat whacky, friendly, excitable, energetic young bloke, whereas Luke was a scrawny, pale, more reticent even shy dude who wrote was I perceived as ultra-romantic poems* often laced with or concluded by references to odd contemporary or teen hero figures such as Jason and the Argonauts (the tv version! ), Simon Templar (aka the Saint), Thunderbirds, Star Trek, Mr. Magoo, Tintin et al. In what seemed a short period of time I saw Luke transform somewhat from the scrawny pale bong-addicted kid to a pasty-faced, sweaty, lip-curling free-basing dealer dude; he unfortunately took on what I call the dealer-power syndrome… But I saw, or see now, this was his way of ‘growing up’. His poetry remained a constant of nostalgic escape, but more of that soon. Each of the nine addresses contained three apartments, ground, second and third floors, and each had a common front entrance on Forbes Street and individual back entrances accessible through a side gate on Burton Street. Each apartment had a locked door on a landing, but because we knew each other so well we often left these doors open when we were at home. One fine afternoon I was reading the Sydney Morning Herald in my front room that was adjacent this open door when I heard someone coming up the stairs. I presumed it was Luke or his brother Felix (Steve had moved out by this time) but moments later someone knocked on the partition saying: ‘Police here!’ I quickly dropped the wide newspaper over the bong and mull bowl on the coffee table and stood up to face the plain-clothes detective. ‘What d’you mean, police here?’ I demanded, blocking his view of the coffee table and unsure if the newspaper had stayed where I had dropped it. ‘Don’t you have to have a warrant to come into someone’s place like this?’ The cop took a step backwards and looked unsure of himself. ‘We do,’ he said. ‘We do have a warrant for Mr. Lewis.’ ‘Well this is a private residence completely separate from Mr. Lewis,’ I said indignantly. ‘These are three separate flats on three separate floors.’ He didn’t say anything straight away. I could see him thinking. ‘Well,’ he said. ‘I’m sorry.’ He began to back away towards the door, saying: ‘D’you want to come down and see the warrant? It’s downstairs.’ I didn’t want to see the warrant but I wanted him well away from my place so I agreed. I grabbed my keys and shut the door and followed him downstairs to the landing. Luke’s door was open and I could see Felix, his seventeen year-old brother, and a mate of his, standing confused and terrified in the lounge room, with a lot of cops passing backwards and forwards around them. I waited on the landing, outside the door while the detective went inside. He returned with a piece of paper. But he didn’t come out onto the landing, instead staying just inside the door of the flat. ‘Here,’ he said, holding the paper out to me. ‘Come and have a look.’ There was something odd about the way he had stayed inside the flat, something weird about the look in his eyes. It occurred to me that if I stepped into that room I could be somehow implicated; and the cops would be legally entitled to search my rooms as well. ‘No thanks,’ I said. ‘I’ll take your word for it.’ ‘Please yourself,’ he said. I didn’t say anything more. I hurried up to my rooms, locking the door behind me. I locked all my doors and went out the back door, not returning until late that night. Luke received community service hours and a fine and moved out. These original poems, and the additional poems to this book, are poems of romantic examination of the sublime state of desire – Dante and Whitman meet Burroughs and Mister Spock; and Luke’s later productions, especially Totem and Interferon Psalms, continue in this vein, if more sophisticated. My question to Luke might be: exile from what or whom? God? Childhood? His drug taking, like all serious drug taking, was a form of worship to an alternative god when all supreme beings have failed. It is widely acknowledged that drug taking is ritualistic, which gives it further religious inference. Is this “sad disco” the church or the institution of childhood? And now (1982 and now?) is he a comedian laughing at his own jokes in his poems, “looking snappy”, swooning at the girl object or the moon, distracting from and obfuscating the overt romanticism (is it really unapologetic as Kelen says in his short essay in the book?) through these common pop tv references? Freud uses the phrase “the censorship of endopsychic defence” in reference to dreams in his interpretation of Dreams, and I wonder if this is not what some (or many) poets also engage in: covering up what they are really saying with distracting, funny-guy throwaways or obfuscations in order to avoid being obvious or even to avoid being understood except by their fellow travellers: their exercise of endopsychic defence? for a day over the jungle hills, and far away “in a beautiful pea-green boat”. *Luke subsequently expressed concern at my take of romanticism in his poems, preferring to see his poems as ‘ecstatic’, from Marvell, Donne, Eliot, Berryman, rather than Keats, Emerson, Ginsberg; and while I accept the distinction, I do not have the negative view of romanticism that exists today. I believe the ecstatic and the romantic are siblings seeking or seeing or reflecting on their take on paradise (or anti-paradise) in the same pea-green boat. But if you find the distinction important, please replace romantic with ecstatic in the above. 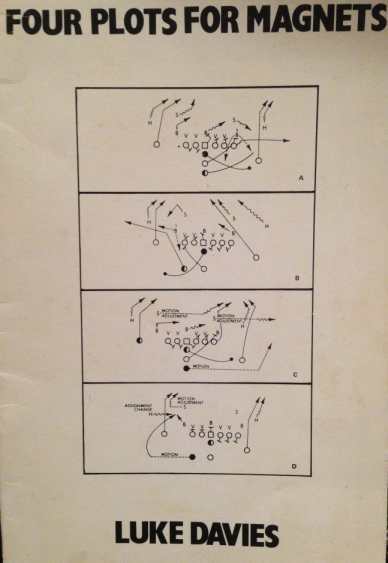 Grant Caldwell’s first book, The Screaming Frog that Ralph Ate, appeared in 1979. His seventh collection of poetry, glass clouds, was published by 5 Islands Press in 2010. He was also published novels and a collection of short fiction. He currently teaches Creative Writing at the University of Melbourne. This entry was posted in Four Plots for Magnets, Grant Caldwell, Issue 8, Luke Davies, Pitt Street Poetry and tagged Australian Literature, Australian poetry, literature, writing by Mark Roberts. Bookmark the permalink.